The operations of Green Resources—a Norwegian industrial tree plantation and a carbon offsets company—have resulted in loss of lands, livelihoods and increased hunger for the local communities at Kachung and Bukaleba—its two sites in Uganda. Its only carbon credit buyer, the Swedish Energy Agency, suspended in 2014 a four million dollar deal until ten key grievances associated with the project were addressed. As the Swedish Energy Agency reassesses whether to resume payments to Green Resources, join a petition from the Oakland Institute to demand it to suspend all future payments, as well as cancel its deal with Green Resources for the purchase of carbon credits in the future! 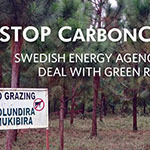 Send a letter to the Swedish Energy Agency here.